Mantis Organics orchestrates the perfect marriage between Coconut & Vanilla in one luxuriously aromatic hand soap. Lather on this liquid delight, courtesy of Mother Nature, offering only the finest botanical ingredients. USDA Certified Organic, restore your skin’s smoothness with your very own genie in a bottle. Aloe Barbadensis (Aloe Vera) Leaf Juice*, Cocos Nucifera (Coconut) Oil*, Potassium Hydroxide, Helianthus Annuus (Sunflower) Seed Oil*, Vanilla Planifolia (Vanilla) Extract*, Cocos Nucifera (Coconut) Pulp Extract*. 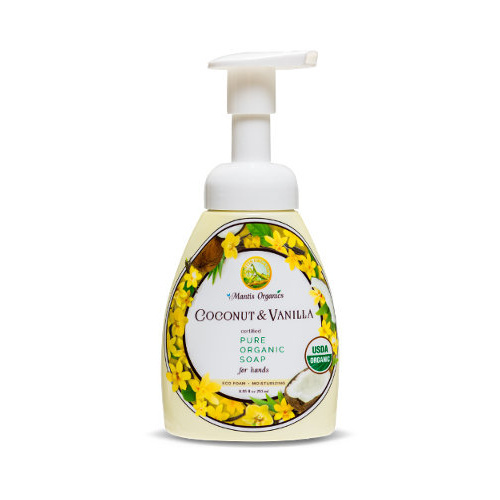 Mantis Organics’ Coconut & Vanilla flavoured hand soap is your skin’s secret recipe to a healthy and youthful glow. Experience the detoxifying power of all-natural food grade ingredients, especially sourced from the very lap of nature’s bounty; trees, plants, flowers, leaves and spices to exfoliate your skin organically. Let your hands do the talking with a product that is USDA Certified Organic and serves to refresh, rejuvenate and regenerate your skin’s texture. This all-vegan blend contains aromatic essences of plants scented with pure essential oils to repair damaged skin for that alluring radiance. Using only the highest quality botanicals nature has to offer, it is free of synthetic fragrances, preservatives, parabens and petrochemicals, thus softening your hands without exposing them to harsh chemicals. Protecting your skin is our top priority and we are proud to do so in the healthiest way possible.